Are you looking for an outstanding versatile hunting dog? 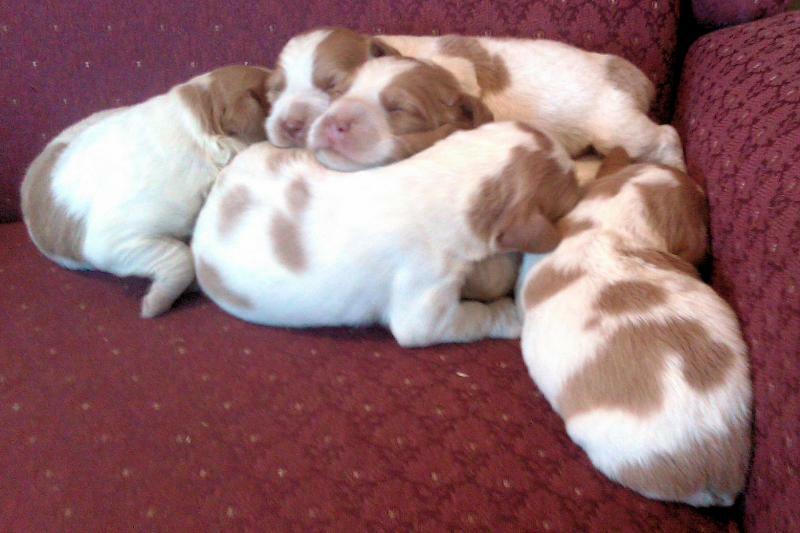 Then one of our Brittany pups might be right for you. Both parents of these pups are excellent hunters that see tons of upland game and waterfowl each year. The pups will be started on pheasant wings when they are ready to go to their new home. These pups should have tremendous hunting potential and be of ease to train in the field! Docked and dewclaws removed. All shots and deworming will be current when you take your pup home. We currently have a litter available to go to their new home May 14th, 2019. 6 females and 4 males are available. Pup selection will be first come first pick on May 14th. We will hold spots for 6 females and 4 males. Price per pup is $600 cash. Checks or credit cards are not accepted. The name "Brittany" is taken from a region in northwestern France. Images of Brittanys were first seen on tapestries and paintings from the 17th century. These images depicted orange and white dogs hunting and retrieving game. The first written and verifiable record of Brittanys comes from a hunting description written by Reverend Davies in 1850. Davies described hunting with small "bobtailed" dogs who were pointed and were excellent retrievers. It was around the same time that the modern Brittany is rumored to have been bred by mating 2 types of English sporting dogs. year. America first recognized the Brittany in 1931 and the breed was approved by the American Kennel Club in 1934. In 1982 the "Spaniel" was officially dropped from the name and the breed became simply known as "Brittany." and alertness. Their gait is elastic, long, and free. Some Brittanys are born with naturally short tails and others with long tails. If born with a long tail it is normally docked to a length of 3 to 10 centimetres (1 to 4 inches). Brittanys come in a variety of colours, where an orange and white coat or liver and white are most common in the American Brittany; other colours include orange roan and liver roan, all of which are acceptable in the show ring. 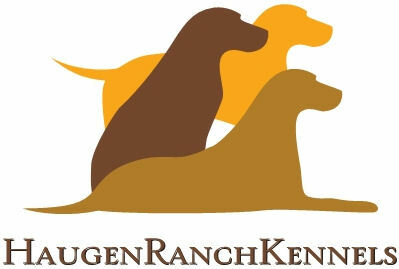 The American Brittany Standard does specify an acceptable tri-colour of liver, orange, and white with very specific color placement which is also acceptable in the show ring. Brittanys should range in a height of 17 inches to 20.5 inches at the withers (17.5 to 20.5 in America), with females at the lower end and males taller. A properly constructed and healthy Brittany maintains a weight between 36 and 43 lb (16 to 19 kg), depending upon height. North American field lines tend to be larger, with many dogs reaching a healthy weight of 45 to 50 lb (20 to 23 kg). The breed was originally bred as a hunting dog and noted for being easy to train and sweet-natured. The breed is generally more sensitive to correction than other hunting breeds, and harsh corrections are often unnecessary. Brittanys are all around sound dogs, as they are excellent family pets as well as working dogs in the field. many Brittanys will need more than this. The breed sometimes gets a reputation for being crazy or uncontrollable, but these problems are almost invariably due to lack of exercise and training, and are not commonly seen in well cared-for dogs. Brittanys can become very shy if not thoroughly socialized, and even among well-socialized dogs there is significant variation in levels of friendliness. With more American dual champions (dogs with titles in both conformation shows and field trials) than any other breed, the Brittany maintains strong hunting instincts in all bloodlines.